TimeToSignUp is primarily known for our sign up sheets, but we also have registration forms available to subscribers with an upgraded account. So should you use a sign up sheet or a registration form? We get a lot of traffic to our sign up sheets, and people try to use them as registration forms. In some cases, they make a column for name, a column for phone number, a column for email address, etc. Unfortunately that’s not the way the sign up sheets work. The sign up sheets are for selecting an item, then entering your info to “claim” that item. Many people tried to make the sign up sheet work as a registration form, got frustrated, then quit. 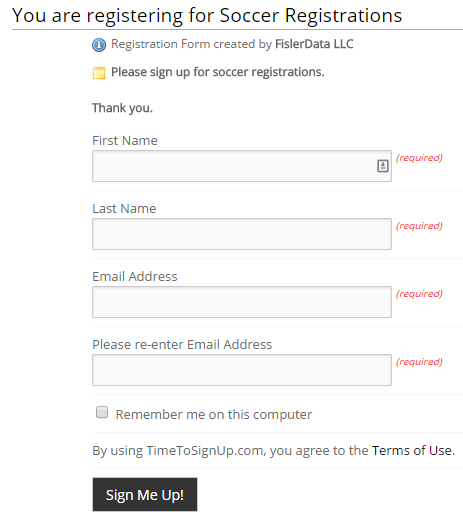 To help our customers, we now have registration forms available on TimeToSignUp.com. Imagine you’re having a workshop. Everyone is attending that event. Instead of using a sign up sheet where people will pick and choose certain items, use a registration form. With the registration forms, you can specify how many people can register for the event. You can collect first name, last name, email address and 15 other fields that you specify. You and the registrant will receive confirmation email. And just like our sign up sheets, your first registration form is free.